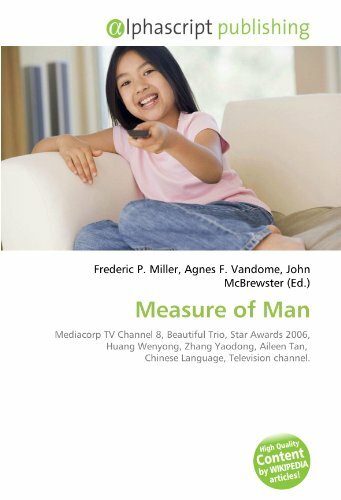 Measure of Man: Mediacorp TV Channel 8, Beautiful Trio, Star Awards 2006, Huang Wenyong, Zhang Yaodong, Aileen Tan, Chinese Language, Television channel. Please note that the content of this book primarily consists of articles available from Wikipedia or other free sources online. Measure of Man is a Singapore Chinese Language drama, telecast on Mediacorp TV Channel 8, 9pm. It made its debut on 7 August 2006 and ended its run on 8 September 2006. It is exactly the opposite of another show, Beautiful Trio, also produced by Mediacorp. While Beautiful Trio examines the problems that Singaporean women face, Measure of Man deals with the problems men face instead, with Huang Wenyong, Ben Yeo and Zhang Yaodong as the lead actors.